Austrian railroad magnate; born at Prague 1819; died at Vöslau June 11, 1883. The son of poor parents, he had to learn early to support himself. He chose a commercial career, and worked as a clerk in Prague and in Vienna, later establishing a business of his own in the latter city. After acting for some time as shipping agent for the Nordbahn, he entered the executive board of this railroad, and finally became its president. Through business connection with the house of Rothschild he became a member also of the boards of directors of the Südbahn and of the Creditanstalt. 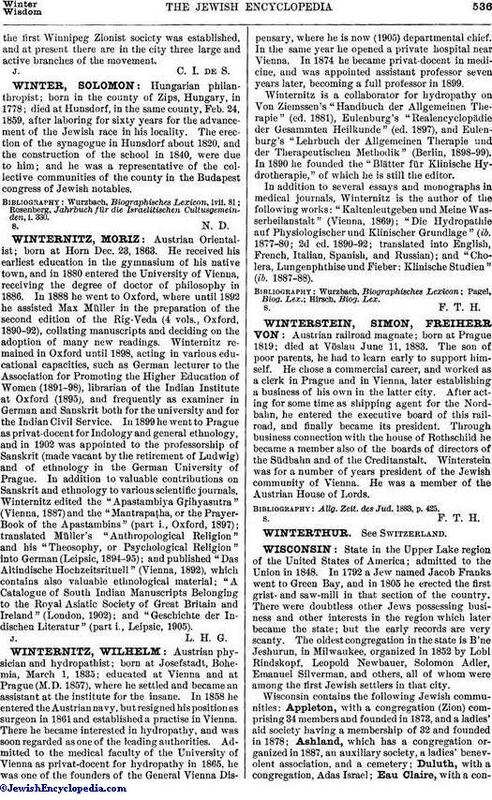 Winterstein was for a number of years president of the Jewish community of Vienna. He was a member of the Austrian House of Lords. Allg. Zeit. des Jud. 1883, p. 425.